The battle for viewers has never been more intense. Today’s connected world makes audiences easier to reach, wherever they may be. But they are also more independent than ever. They’re free to curate their own watchlists, rather than rely on the schedulers. With so many channels and platforms out there, competition is fierce. Standing out from the crowd is central to the success of any TV show or film marketing project. There are strategies that can help to target the right audience. The end goal is to catch their attention. To get them to engage and share your message with like-minded people. Social media is a crutial tool within a content marketer’s arsenal which cuts out the middle man, allowing you to go direct to groups that have shown interest in what you’re promoting. It gives you invaluable user data, market intelligence and tangible results to show the return on your investment. But social media engagement can also be something of a minefield and take up a lot of time and resources. Output can fall flat without a planned approach and supporting quality content that backs up your message. This leads to disappointing engagement levels. Bringing an expert full-service digital creative agency like DMS onboard can have a positive impact on a campaign. It’s no longer about running simple TV advertising and print campaigns. Today, brands need to be posting more strategically, at the right frequency, to reiterate the marketing message. This requires the creation of a variety of original and quality promotional content. The knowledge gained from social insights means that content, TV and film makers can really understand a target audience. This ensures you are delivering the right message at the right time, on the right platform. Two recent projects we’ve provided social media campaign management on have supported home entertainment releases of popular TV dramas. Following the success of Danish police procedural; The Killing on British TV, Nordic Noir and world cinema have experienced a surge in popularity. The genre now has a dedicated and growing fanbase. The Bridge and Gomorrah are two further titles from mainland Europe that have caught the public’s imagination. Working with the distributors to capitalise on the shows’ successes; we’ve helped to introduce the titles to a wider audience through effective content marketing. 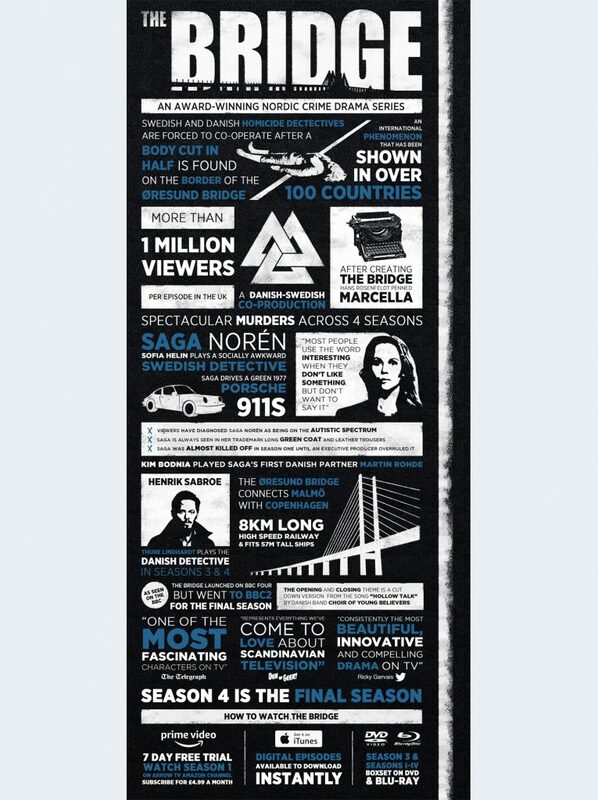 To promote the home release of the final season of Nordic Noir TV drama series, The Bridge, we created 146 social posts and more than 25 unique assets. Like The Killing, this Danish/Swedish production had also built up a cult audience, due to a fascination with enigmatic lead character, Detective Saga Norén. This posting approach was carefully planned. It started with social listening to understand the conversation around this and similar shows. Our specialist team developed a comprehensive posting plan along with original content creation including social banners, motion posters, trailer cutdowns, cinemagraphs, animated packshots, shareable videos and an infographic. The aim was to promote the new series over a 12-week period, coinciding with the UK broadcast launch on BBC Two. Creating interaction was key to the success of the campaign. To drive conversation within the fan community, we posted a dedicated branded asset after each week’s episode. Each GIF or meme had a call to action encouraging fans to share thoughts and theories on the series’ latest plot developments and twists. This agile approach to campaign management spread activity across four social media platforms. 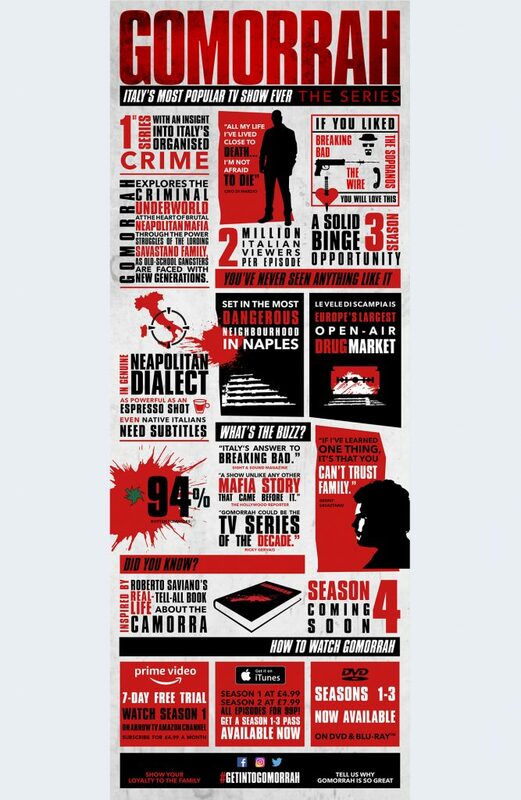 We also targeted specific Nordic Noir and The Bridge fan pages. The campaign generated 2.3 million organic impressions. Engagement was as high as 180,000 video views and 57,000 interactions. Through our earned media, we generated an extra 22,000 mentions and 97 million potential impressions. 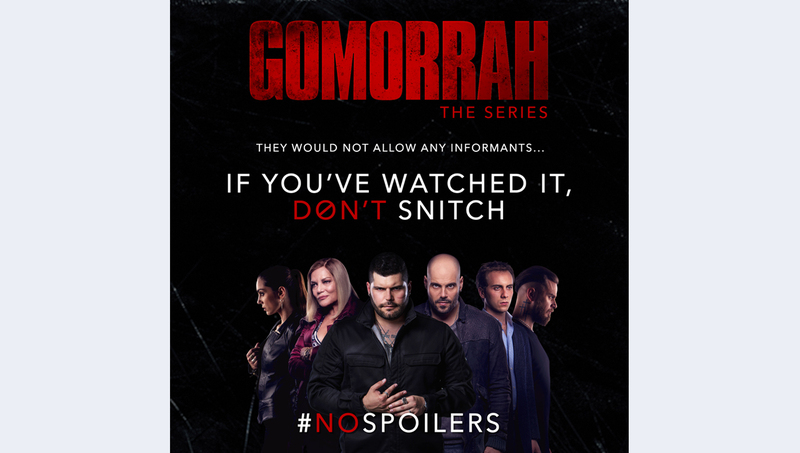 For the UK home entertainment release of the third season of Italian organised crime drama, Gomorrah, DMS’ Social and Creative & Digital teams produced 22 original social media assets and 38 posts. This included planning, creating, and publishing a variety of tailor-made assets. Visually high impact content was at the centre of the campaign. Motion posters, animated packshots, trailer cutdowns, cinemagraphs, shareable videos and an eye-catching infographic helped to attract new fans to the show. An important ingredient was the six-week content calendar that included posting 14 Facebook updates, 19 tweets and five Instagram posts. Consistency and planning was achieved with a specialist social media content marketing tool to schedule posts. We then engaged with the fan community around the show by tracking their reactions. The content peformance across three owned channels, which included a new Instagram account for the series, was significant. The campaign generated 1.5 million impressions driving over 190,000 video views and 32,000 engagements. Organic community engagement with new fans proved particularly effective. More than a half of all people reached on Facebook had not previously liked the series page. This demonstrated that the posts had driven reach beyond the existing fanbase through comments and shares. Using social buzz monitoring to understand the wider impact of the campaign, the team tracked 7400 mentions, with over 24 million potential impressions achieved via influencer and editorial outreach. Today, showing a return on investment and engagement is key, and social media can provide real-time intelligence and actionable insights to build awareness and viewers. Simply put, effective TV and film marketing strategy including social media listening, has the power to take you beyond who tunes in each week. Whether delivered standalone or as part of a combined 360-degree approach, DMS devises and executes engaging and focussed social media campaigns. From social posting, social media listening and community management to content creation and live streaming, DMS enables brands to reach their audiences. Our in-house creative and production services can produce a range of targeted quality social content to support this activity. By working on some of the highest profile entertainment projects, DMS has honed its unique approach to social media management. We have the infrastructure and expertise to identify and understand an audience. We can plan, react, work in many languages, to deliver impressive results. Learn more about our social media management services, and the benefits they can bring to your business, by contacting Anna Zaikina at DMS on anna.zaikina@dsukltd.com.